Alright, folks. Here's some of the loot I scored the other day while thrifting. (Isn't that belt with the little chain darling?!) And as alluded to in yesterday's post, I'm still running on pretty high inspiration levels, which I will use to the best of my abilities today for another quick (and hopefully cheap!) shopping trip. Also, I have to apologize for my horrible hair lately. Getting the bangs trimmed tomorrow so no more headband/bun combo! Love the combo of the frilly dress and grandpa sweater! You look great!! this really nice! from girly dress to comgy carigan & boots! love it! you're outfit is ridiculously pretty! I love the tiered dress and neutral browns. thrifting is the best and i love that the look wasn't a fortune. I love that dress! You are such an inspiration! I like the score of the belts!! Luckyyyy! The way you've styled the boots reminds me of Pradas Winter 09 wader style boots. Looks awesome. The layered belts are GENIUS! Holy Moly, those tan boots are a SCORE! I love the dress! Its so fun with the new belts. Love grey with red...you're always super stylish!! Wow! I love your blog! I am so happy we introduced each other yesterday. I am sort of new at all of this and just finding out how HUGE / small this world its. I just finished photographing my loot from yesterday. You made VERY good use of those belts! the headband bun combo is adorable! and i especially love the way you paired those brown boots with the scrunched up black socks! lucky you on the boots!! i can never find any here in the Bay area!! =( haha soo cute!! Those are such gorgeous boots! I've always wished I could thrift some but I've never had any luck. I really like this outfit, even more so because of all the thrifted elements. I really respect people who make secondhand clothes look so great! i love the dress with the boots. great finds! i love that blue ruffle-y dress! so pretty. I love that belt! So cool! great outfit ! i love your boots and your belts are really great worn as you did ! I love every bit of this, including the location hinting in the corner! I love the look of two belts together- very unique. Love it! Really like your boots! 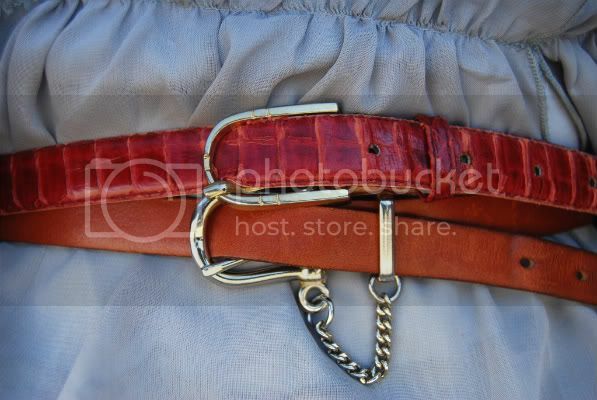 I love this ruffled dress with the double belt.